Boundaries affect both spatial properties and human behaviours. The ways in which people relate to boundaries determine how space is processed and developed. This paper aims to clarify the relationships between people and boundaries and provide insights for the design process and facility management. The paper explores the everyday lives of people in densely populated urban areas. Behavioural observation was the basic methodology, while multiple case studies provided valid explanations about how boundaries interact with space and people. The paper analysed the dependent relationship between space and boundaries and classified the boundaries in Hong Kong’s Mass Transit Railway (MTR) to determine how policymakers, designers, managers, and users perceived and reacted to boundaries in MTR stations. 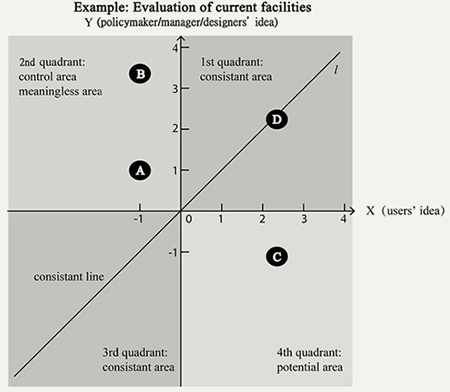 Based on the user-centred design perspective, a quantitative description presented a method of evaluating existing boundaries. The end of the paper provides insights for boundary design in order to achieve a better quality of public life to people in their everyday lives. Key Words – Boundaries, Mass Transit, Public Design, Public Space, User-Centred. Relevance to Design Practice – The results of the research offer designers a new perspective from which to examine the relationship between boundaries and space during the design process. This paper explored the significant role of user practices and contributes to the quality of boundary design in public space. Citation: Zhao, T. J., & Siu, K. W. M. (2014). The boundaries of public space: A case study of Hong Kong’s mass transit railway. International Journal of Design, 8(2), 43-60. Received March 16, 2013; Accepted January 3, 2014; Published August 31, 2014. Copyright: © 2014 Zhao & Siu. Copyright for this article is retained by the authors, with first publication rights granted to the International Journal of Design. All journal content, except where otherwise noted, is licensed under a Creative Commons Attribution-NonCommercial-NoDerivs 2.5 License. By virtue of their appearance in this open-access journal, articles are free to use, with proper attribution, in educational and other non-commercial settings. Tianjiao Zhao received her B. S. and M. S. degree from the Harbin Institute of Technology with the majors of industrial design and mechanical design (2005-2011). She is currently a PhD candidate with the School of Design, The Hong Kong Polytechnic University. She is also Academic Visiting Scholar in National Taiwan University (2013-2014). Her research focuses are in public space and facility management. She has published several journal and conference papers on the research of urban transit and public space. Kin Wai Michael Siu is Professor of Public Design of the School of Design, The Hong Kong Polytechnic University. He is also Chair Professor of Wuhan University of Technology and Visiting Professor of Tsinghua University and CAFA, China. His research areas are in public design, user reception, and problem identification. Just as life changes rapidly in a modern society, so does space. As important elements of space, boundaries are generated for many reasons and are presented in many forms. It is difficult to judge whether a space generates boundaries or vice versa. Both exist within an ambiguous and dependent relationship and both are affected by user interaction, which makes the relationship even more complex. Our interactions with boundaries affect the quality of the space, while the design of those boundaries determines the quality of our lives in that space (Hsia, 1994). Given the strong effect of boundaries and space, it is vital that we perceive and develop the relationships among these factors. User-centred design can improve the users’ quality of life (Coleman, Clarkson, Dong, & Cassim, 2007; Garner & Evans, 2012; Green & Jordan, 2002; Patterson, 2012). While the user-centred design method is widely respected and considered successful, it is difficult to generate public space designs with a high degree of user fitness, because user behaviour within such spaces is so unpredictable (Siu, 2003; see also Hsia 1994; Yigitcanlar, 2010). In addition, a number of researchers in different disciplines, including sociology, civil engineering, and urban planning, are still trying to define public and private boundaries (e.g., Baroth, Schoefs, & Breysse, 2011; Baxter & Kroll-Smith, 2005; James-Chakraborty & Strümper-Krobb, 2011; Valk & Dijk, 2009). This paper used the Hong Kong Mass Transit Railway (MTR) as a case study. The MTR is a public transport system managed by a private company; it provides users with normal but distinctive public spaces. The existence of boundaries in these spaces and how users behave within those boundaries are both typical and unique. This study provided a systematic perspective for discovering, perceiving, and designing public space boundaries. It reviewed boundary definitions and theories to illustrate how boundaries relate to space and discussed the research methodology, including case studies and observations. The MTR’s boundaries were then categorised into five groups so they could be considered in a new light. Based on an analysis of user behaviour within these boundaries, the user-centred method was applied to examine how the boundaries were designed. In the process, it developed methods to evaluate existing boundaries and suggest design instructions. Boundaries exist throughout our social environments (Ozaki & Lewis, 2006). It is widely accepted that boundaries play a significant role in characterising both physical space and the psychological world (Baroth et al., 2011; Weintraub, 1997). Ashihara (1983) clearly identified in the studies related to aesthetic townscape that “without boundaries, there is no space” (p. 2). As boundaries always exist along with space, the definitions of boundaries are always related to different concepts of space. In his classic work, The Image of the City, Lynch (1960) claims, “cities are constructed using five elements, including paths, edges, districts, nodes and landmarks” (p. 36). Edges represent boundaries between two phases or linear breaks in a community, which can include shores, railroad cuts, and walls. They can be barriers that close off one region from another or seams that join two regions together. In Lynch’s theory, boundaries do not demonstrate a fixed form; rather, each individual boundary interacts with other elements in the city and changes according to the people and time. Boundaries are also interpreted as “signifiers of space” (Sack, 1986), while Blomley (2005) mentions that “boundaries are succinct statements and the only symbolic forms that signify possession or exclusion in a space with direction” (p. 285). In brief, boundaries signify and differentiate (Blomley, Delaney, & Ford, 2001). They unify the insides of the space that they mark (Hsia, 1994; Lynch, 1960). It can be concluded from the above claims that the basic function of boundaries is to separate. Ozaki and Lewis (2006) give a more generalised explanation. They state that boundaries function at three distinct but related levels: physical (spatial), sociocultural, and psychological. Thus, “the boundaries at the physical, spatial level are concrete manifestations of social classifications, and social classifications are internalised by people and experienced phenomenologically” (p. 91). Lawrence (1984) states that boundaries are restrictions that regulate our daily affairs and behaviours during our interactions with space. These restrictions result in unwritten rules that describe how to behave in social space (see also Boyer, 2000; James-Chakraborty & Strümper-Krobb, 2011; Valk & Dijk, 2009). Lefebvre (1974/2010) has a different view about boundaries and space. In The Production of Space, he points out that each body produces space by itself. He uses the metaphor of a spider’s web, an object that becomes inseparable from the body that creates it, to illustrate that the most basic places and spatial indicators are first of all qualified by a body. Boundaries exist along with space, and so each body places a boundary on the space it produces. Siu (2001) notes that once the web vanishes, the boundary is destroyed and the space is invaded; hence, the web becomes incomplete and unbalanced. The study aimed to provide an in-depth investigation into users’ practices with boundaries in the public space and shed light on design issues that are relevant to boundaries and space. A qualitative research method was used because it can develop an in-depth understanding of human behaviour and the reasons behind such behaviour (Denscombe, 2010). Merriam (1988) has pointed out that the case study design is “an ideal design for understanding and interpreting observations of social phenomena” (p. 2). Since the core objective of this study is to define the relationships between people, spaces, and boundaries and understand the ways in which users operate in public spaces, the use of a case study approach is a suitable strategy. The research activities were conducted over two phases, the first being general research and the second detailed research. 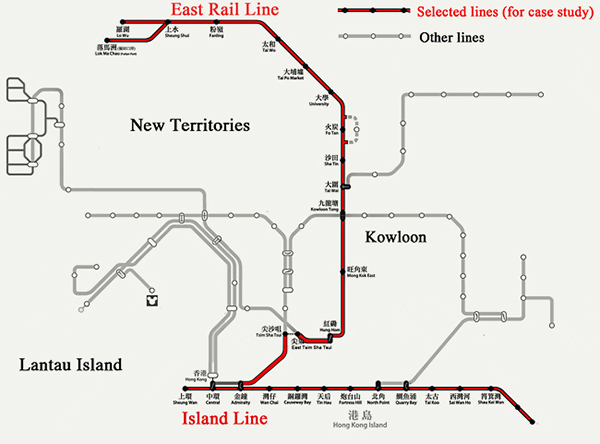 The first phase involved obtaining an overview of MTR boundaries by randomly observing 84 stations. The MTR is one of the largest transportation systems in Hong Kong; it carries an average of 4 million passengers every day. The users of this public space are of diverse ages, occupations, cultural and educational backgrounds, and locations. The space is shared by many users (not only passengers, but also workers, visitors, and people seeking business opportunities); thus, it is common to see different interactions occurring between users and users, users and space, and users and policies. 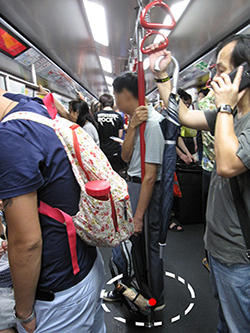 The MTR is a typical public space, and so was deemed suitable to conduct a case study about boundaries. 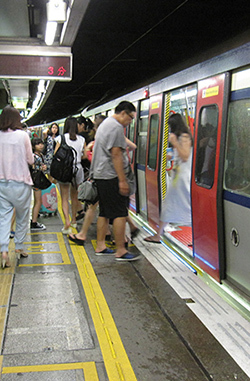 The second phase of the study focused on specific MTR lines. The in-depth nature of researching these specific areas over a long period of time was expected to provide reliable evidence and insights. Considering the number of users and the functions and sizes of the stations, the East Rail Line and Island Line were selected as the cases. The connecting stations between these two lines, Tsim Sha Tsui and Tsim Sha Tsui East, were also researched. These two connecting lines include transit shipment stations and Sheung Shui Station, which are filled with bootleggers. The study also covered the nearby shopping areas, residential areas, financial centres, and schools. It was important to determine how users from various backgrounds interacted with the boundaries and how the boundaries were designed in the heterogeneous MTR public space. Figure 1 is the MTR map. The research cases are marked in red. Figure 1. MTR map (the research cases are marked in red). Observations can be adopted to “obtain a better understanding about people’s behaviour in the environment as it is a method of looking at action between people and their environment” (Sanoff, 1992, p. 33). Some regulations can be found from observation, as field observations give a more genuine picture of what it is like to interact with boundaries “in the field” (Siu, 2007, p. 39). As design practice becomes increasingly focused on people, focusing on and modelling human behaviours have become explicit aspects of designers’ responsibilities (Keinonen, 2010). Observations can also “cover events in real time and cover the context of the event” (Yin, 1994, p. 80). For the study, the observation findings were recorded with a camera and qualitative descriptions. The collected data included observations of the boundaries and users’ interactions with the boundaries. 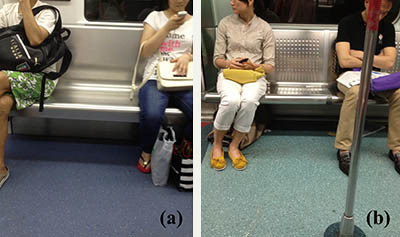 These included: (a) how boundaries exist in the public space; (b) the form of the boundaries; and (c) how people interact with the MTR boundaries. Observation was conducted in both time and space. The research geographical area of the study covers the area of the whole station, including the passway platform and train compartments. Observation was conducted every day, even on holidays. Every day was divided into early morning, rush hour, noon, afternoon, rush hour, evening, and night. The whole observation continued for half a year, thousands of passengers’ behaviours were observed, and boundaries in 29 stations were defined in this research. The pictures of the collected boundaries are shown in Appendix 1 and the statistic results of the frequency of occurrence of these boundaries in some typical stations are shown in Appendix 2. Interviews can be used to obtain first-hand information from subway users. The tool was used to offer an advantage supplementing the data collected from observation. The paper used both structured interviews and unstructured interviews. Unstructured interviews were asked in an open-ended manner. In Berger’s (1998) words, this kind of in-depth interview aims to discuss not only “what have people done?” (p. 55), but also “why have people done it?” (p. 62). Finally, the collected observation data and the interview result were used together to conduct the findings. During the processes of interview and observation, audio and video recording are effective instruments, as they provide precise transcripts of naturally occurring interactions and allow an understanding of how that interaction is organised (Marginn, 2007). 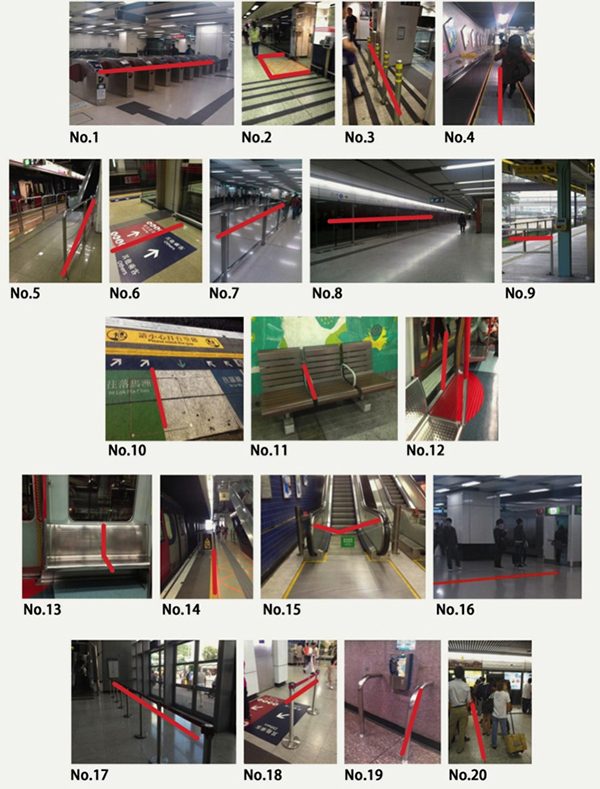 Based on the preceding theories and definitions, several examples from the observations in Hong Kong’s MTR stations were selected to illustrate the relationship between public space and boundaries. Boundaries and space represent two sides of the same coin. Without boundaries, space has no beginning or ending. Without space, boundaries have no carrier. Boundaries separate space into several smaller units with diverse properties. The diverse properties of space impel the generation of boundaries. Their emergence can proceed differently depending on the situation. However, once boundaries and space emerge, they are mutually dependent for existence. The MTR examples show this dependent relationship. The yellow line (i.e., warning line) in Figure 2a is a boundary that separates the space into two parts designated as “safe” and “unsafe.” This boundary was designed to highlight the hidden danger of the space, and Figure 2b shows that most people obey the boundary control while they wait for trains. Figure 2. Boundary on the platform before the train comes into the station: (a) boundary and (b) peoples’ behaviour. When the train pulls in, the properties of the space on both sides of the boundary (“safe” and “unsafe”) disappear. At this moment, the boundary (yellow line) loses its meaning. Figure 3 shows that, as people swarm into the train compartment, the boundary ceases to serve a separation function for the users. Figure 3. People swarm into the train compartment. As boundaries and the properties of space depend upon one another, the paper focused on the MTR’s spatial properties to analyse how boundaries are generated and how they distinguish these spatial properties. A boundary divides one space into two parts, and each part has its own properties. These properties can be opposed or complementary. Boundaries exist at the blending point, when different spaces with diverse properties encounter each other. Where diverse properties of space exist, so do boundaries. The MTR case study described the character, function, and size of the space and used examples to analyse its properties. While boundaries change these three spatial properties, they are not absolutely coordinated, but rather overlap and contain each other. The following examples show the relationship between the boundaries and these properties. Just as each person has a distinct individual nature, each space has its own character. In Genius Loci: Toward a Phenomenology of Architecture, Schulz (1979/2010) promotes the genius loci viewpoint and mentions that each place has its own character and carries symbolic meaning. The same can be said of an MTR station, in which boundaries strengthen and sometimes add to the characteristics of the space. A ticket barrier divides the whole space, from the entrance to the train compartment, into two main parts: the paid area and the unpaid area. Each area has its own characteristics, and the facilities, shops, policies, and functions of the two areas differ. This boundary is an obvious one and lends diverse meaning to the space. The boundary in Figure 2a is also a dividing line between safe and unsafe areas. In this example, spatial characteristics emerge first and then a boundary is designed. This differs from the ticket barrier, in which case the boundary is designed first and lends properties to the spaces on each side. Spatial characteristics are also designated as “public” and “private.” Privacy is both an intangible social concept and an ambiguous spatial boundary (Ding, 2008). There is no public consensus on appropriate boundaries or acceptable etiquette for private behaviour in public spaces (Wei & Leung, 1999). For example, homeless people who are obliged to live their private lives in public view are treated as outcasts (Cresswell, 1996). Some scholars use the word “semipublic” when it proves too difficult to define (Gehl, 1987/2011; Huang & Mynatt, 2003). Although private and public spaces are not always rigidly defined, they are typically distinguished by their social and ideological functions and material and social conditions (Lee, 2009; Marx, 2001; Weintraub, 1997). Boundaries are always used to define privacy. According to Nippert-Eng (2007), one can draw boundaries around self and family where one prefers them to be. Figure 4 shows how the MTR creates a boundary between public and private space: The baby pram provides babies with a space to sleep in, thus marking an exemplary boundary between private and public space. Whether the boundary is obvious or ambiguous, it always exists. Figure 4. Pram in the train compartment. The MTR functions as an important service system in Hong Kong. Its spaces are divided into hundreds of obvious functional areas, including areas for personnel and users, areas for waiting and walking, and areas for sitting and standing. Almost all of the spaces in the MTR stations have defined functions; boundaries form where the spaces meet. 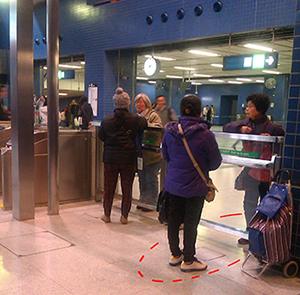 Figure 5a shows a line on an MTR station floor that marks a boundary between commercial and walking spaces. In addition, different MTR shops are divided by concrete walls. In Figure 5b, auto machines divide a space into four areas, as each machine serves a unique function. The space in front of each auto machine can be considered to belong to that machine. Although there is no visible boundary, each area is distinguished by the function it offers for users. Figure 5. Space with boundaries to divide their functions in a MTR station. As mentioned before, each space divided by character and function is accompanied by a spatial division in size. Although different spaces may share similar characteristics, boundaries still exist to keep their sizes under control. Figure 6a shows the difference in seat sizes due to the absence of boundaries on the seats. However, in Figure 6b, when a boundary for each seat is introduced, users are more likely to consider each seat as fit for one individual. Figure 6. Boundary on the chair of MTR compartment: (a) not obvious and (b) obvious. Boundaries and spatial properties exist everywhere in MTR stations. While some boundaries are easy to perceive, others are invisible. The analysis of spatial properties plays a significant role in designing the boundaries. 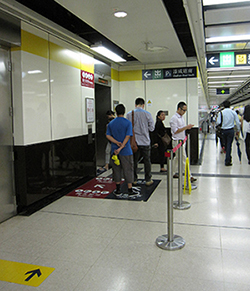 This section classifies the boundaries in MTR stations and examines how physical boundaries and user perceptions of those boundaries are formed. Almost all of the objective boundaries are noticeable upon classification, and some subjective or invisible boundaries are also discovered. Ozaki and Lewis (2006) have categorised the boundaries into three groups: physical (spatial), sociocultural, and psychological. 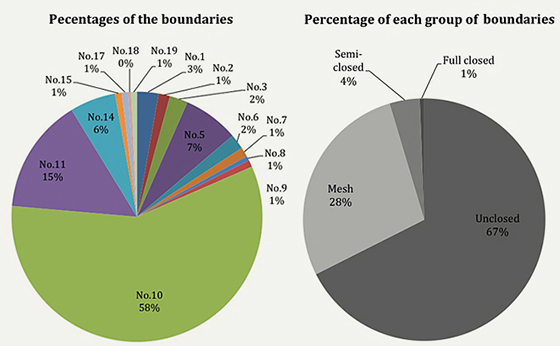 Liu, Xu, and Lei (2011) classified the boundaries into rigid boundaries and soft edged boundaries. A rigid boundary is an unmovable boundary in the physical world. Gehl (1987/2011) first proposed the concept of a “soft edged” boundary to describe the transition from a public space to a private space. To obtain users’ perspectives towards the boundaries, the collected boundaries in the subway were used to design a questionnaire. Then, pictures of the typical boundaries were shown to selected subway users who were the participants in the study. The subway users are of diverse educational and cultural backgrounds, and using pictures was the most intuitive and accurate way to describe the boundaries. An interview was conducted with ten subway users, who were asked to classify these boundaries and explain their reasons for classifying them thus (Appendix 2). By analysing the users’ categories of and interactions with boundaries, researchers organised the results with an expert categorization based on users’ behaviours and opinions. It was found that the boundaries can be classified according to their form, shape, and visibility. The visibility of boundaries describes whether they can or cannot be seen. Based on the forms and shapes they take, boundaries can be defined as free style, unclosed, meshy, semi-closed, and full-closed; within these categories, they can be defined further as texts, lines, planes, and objects. Taking these classifications into account, both visible and invisible boundaries become more concrete and specific. Figure 7 shows the classification of each boundary, with dotted lines indicating the fluidity of the definitions. Based on the data collected through observation, the percentage of each kind of boundary in the station is shown in Appendix 3. Figure 7. The five boundary classifications. Table 1 shows the classification results of the examples collected. Because an invisible boundary is not easy to perceive, the four visible classifications were first analysed using typical cases. Almost all of the physical MTR boundaries can be identified; those that share a group always retain the characteristics of that group. Table 1. Classification of visible boundaries. Invisible boundaries exist everywhere, and there are often more invisible boundaries than visible ones. Ozaki and Lewis (2006) classify boundaries into three levels, including physical, sociocultural, and psychological. The latter two levels are invisible. The researcher collected invisible boundaries by observing users’ interactions with the space, facilities, and other users observed in the research. Through observation, it was found that invisible boundaries are generated by the habits, values, and cultures of society. They place restrictions on behaviour during human interactions with space and other people. Figure 8a shows an MTR escalator. 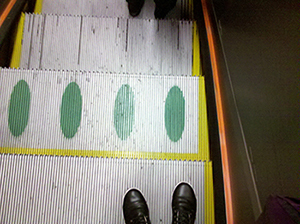 In Hong Kong, it is widely known that users who want to stand should be on the right and those who would like to walk down the escalator should use the left side. Citizens obey this rule because they find it convenient. There is no visible boundary on the escalator and no written marking on the steps; people obey the rule because an invisible boundary has been created in their minds. Figures 8b and 8c show two similar phenomena related to queues in public spaces. These invisible boundaries apply to people when they create or encounter a line. Figure 8. Invisible boundaries in a MTR station: (a) escalator, (b) ATM, and (c) platform. Lefebvre’s (1974/2010) theory states that each body produces space by itself, and that space is a small field around the body that exists with the body all the time. When people are in a public space, they will try to avoid touching others, no matter how crowded the space becomes. This explains why people prefer to sit next to empty seats rather than next to a stranger. Figure 9 shows how each person attempts to claim his or her own space without disturbing (touching) others. Figure 9. Body field in a MTR compartment. These classifications are neither absolute nor unchangeable. They often overlap due to the differences that occur within different times, environments, and ideology characteristics. As time passes, some boundaries change form. Figure 10 shows the transference of an invisible boundary to a visible one. Figure 10. Visible boundaries on an MTR station escalator. When boundaries are divided into visible and invisible categories, it is easy to perceive the space and look for the boundaries. A space can be considered to be an area divided by visible or invisible boundaries into several parts. When these boundaries overlap each other and flow from one form to another, they make the whole space active and colourful. An MTR station is neither a natural space nor a mental one, but is a physical public transport space operated by people. As people have unique perceptions of the world and interact with the world through participation (Dittmar, 1992, as cited in Ozaki & Lewis, 2006), boundaries can be perceived in terms of human participation. Only when people interact with the boundary can it be called a boundary. If a space is not used by or open to users, its boundaries are meaningless. To recognise the MTR’s boundaries, consideration must be given to the ways in which people interact with them. In current Hong Kong culture, peoples’ behaviours in relation to boundary design can be divided into two aspects: passive and dominant. As Lynch (1960) notes in The Image of the City, the city is a text with grammar “written” by planners and historical accretion and “read” by urban citizens. According to Siu’s (2008) study on the quality assurance of public space in cities, there are three major groups of people necessary to be considered: policymakers, designers, and managers. These three groups work together to decide what information about a space is presented to its users. The generation sequence always works in the same way. First, the policymakers make a generalised decision and the designers try to realise the total idea. The managers then input changes to make the whole system safe and stable. Finally, users try to decode the meaning introduced by the “non-users” (policymakers, designers, and managers). In this process, design becomes “a process of enquiry during which meaning is constructed with diverse stakeholders” (Kimbell, 2011, p. 49); solutions are not perfect resolutions, but rather address certain perspectives and interpretations of meaning (Lockton, Harrison, Cain, Stanton, & Jennings, 2013). Users are also referred to as “end users” (Junnila, 2007; Pemsel, Widén, & Hansson, 2010). Users passively accept public space boundaries all the time. However, in this context, “passive” does not mean negative. Figure 11 shows a boundary in the MTR that was arranged by managers. This “meshy” boundary divides the space into two parts that both restricts and regulates user behaviour. People obey the restriction as a matter of course. Figure 11. Passive, but not negative, boundary. Another interesting phenomenon occurs when comparing MTR stations with downtown Hong Kong streets. Siu (2001) examines many cases surrounding the re-territorialising behaviour of shop owners and observes that city users often set up new boundaries when redefining meanings and functions of space. However, in the case of the MTR, shop owners are strictly restricted by station boundaries. Figures 12a and 12b compare an open market shop boundary to an MTR shop boundary. In Figure 12a, the downtown shop owner extends his territory towards the street, while Figure 12b shows how the MTR shop’s design implements a more withdrawn presentation. As the MTR is a system of public spaces managed by a private company, the private company is able to exercise more controlling influence over use than is seen in other, non-privatised public spaces. Figure 12. 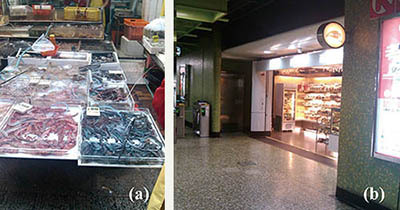 Shop owners’ behaviour: (a) downtown shop and (b) MTR shop. As mentioned before, non-users play a dominant role in both design and management for public spaces. Non-users generate the space and the objects in it (as shown in Figure 13). Although some user surveys are conducted during the creation process, it is not easy to imagine how people will interact with the space and facilities in the real world, as different people can have different interpretations of the same content (Pask, 1975). What the users perceive may not be what the designers, policymakers, and managers conceive. Figure 13. Design of the MTR managers. Although almost all possible boundary interactions are imagined and designed by non-users, users are not always passive receivers. Users have the ability to re-territorialise boundaries, and can do so instinctively in any environment. Siu (2007) has stated that city users–individuals–are perhaps able to find and manage a way to live in an environment in such a way that best suits their everyday lives. De-territorialisation and re-territorialisation are both common phenomena in public space. De-territorialisation refers to taking control and order away from a land or place (territory) that is already established, thus effectively undoing what has been done. Re-territorialisation involves the restructuring of a place or territory that has experienced de-territorialisation. It can be interpreted as removing existing visible or invisible boundaries and constructing new boundaries in their place (Brenner, 1999). Figure 14 shows three old women working together to recover newspapers from pedestrians at the entrance/exit of Hung Hom Station. Like a boundary, the bias line constructed by their bodies restricts the walking direction of pedestrians. The women do not stand directly behind one another; as such a line would hide some of them from the sight of pedestrians. Meanwhile, people always choose to walk around the crowd of women instead of moving between the intervals among them. Every morning, the women re-territorialise these visible and invisible boundaries with their bodies at the station exit, and it more or less affects user behaviour. Passenger interviews reveal the following opinions of this boundary. Interviewee 1: I can see them every day when I go to school. Sometimes I even give the unread newspaper to them as the old women look so poor. I seldom go across them as their arms would reach out to me, which makes me uncomfortable and slows down my walking speed. Interviewee 2: I often skirt around them because I do not want to give my newspaper to them. It seems that they have already occupied that territory. I know it is an excellent team, although they are old women. Haha…. Figure 14. Boundaries constructed by old women. 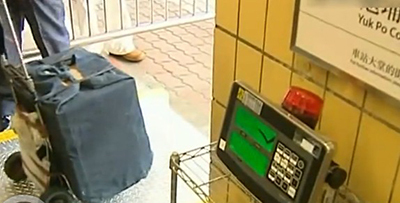 The same phenomenon happens at the station’s ticket barrier. Figure 15 shows a common phenomenon in Tai Wai Station: a group of old women chatting on each side of the ticket barrier. Although the barrier prevents the women from crossing freely, it does not affect the communication among them. In this case, the physical boundary only affects where they stand. Kaya (2004) notes that when people own a space, they change their environment and overcome their territoriality. 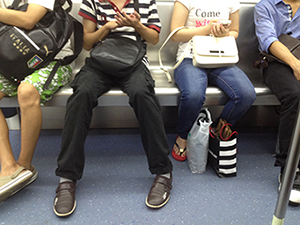 The observation in Tai Wai Station indicates that, because the height of the boundary allows the women to lean over it, the semi-closed boundary acts as a table for women to chat around. When the boundary between the paid and unpaid areas was de-territorialised, an invisible re-territorialised boundary emerged around the women, dividing the semipublic space from the public space. We interviewed the older women about their behaviour. Interviewee 1: OK la... I just talk with my friends for a while. If I go out, I need to pay the money. I am not that stupid. This is a good place for us to talk with each other. We didn’t affect other people and we didn’t violate the rules. Figure 15. Women chatting at Tai Wei station. Users also re-territorialise boundaries in train compartments; as there is no special compartment for babies, they stay with their parents. For example, in one observation, an infant was crying in the compartment due to hunger and continued to cry over the course of two train stops. The crying disturbed the people in the compartment and the mother felt embarrassed. She finally decided to feed the baby and asked her friends to cover her and the baby with clothing while she did so; in this case, the mother re-territorialised a private space for herself and the baby with a “full-closed” boundary. An additional example of how people create their own space involves use of the handrails in the compartments, which passengers can use for support when crowding in the compartment requires some passengers to stand. The railing is designed to allow many people to grip simultaneously, with each passenger taking up a hand’s width of space. Figure 16 shows one boy’s use of the handrail, which included leaning against it and taking up the entire space around it. In line with Lefebvre’s (1974/2010) theory, each person builds a field around his or her body; hence, other users in the same compartment would not cross the boy’s boundary unless the compartment became too crowded. The boundary exists whether or not it is strictly visible. Figure 16. Boy leaning against compartment handrail. The above examples reveal the different ways in which the users of a place or facility interact with boundaries. These interactions are an important factor in generalising, developing, and changing boundaries. Analysing this research will make it easier for users to perceive the boundaries and for non-users to design boundaries that complement the spaces we create for ourselves. Many scholars have developed and promoted the user-centred design method to improve the quality of space (Veryzer & Borja de Mozota, 2005; Siu, 2008). The Usability Professionals’ Association (UPA) (2008) defines User Centred Design (UCD) as an approach to design that grounds the process in information about the people who will use the product. UCD processes focus on users throughout the planning, design, and development of a product. UCD is regarded as a broad umbrella covering several approaches that follow generic UPA principles (Keinonen, 2010). Siu’s (2007) long-term study of public space in Hong Kong stated that “designers should not become a weapon with which they impose their personal preferences on users … but make good use of their knowledge and experience so as to assist users to fulfil their own preferences and needs” (p. 45). Each construction project should keep its end users in mind throughout the process (Dewulf & van Meel, 2002). MTR boundary designs, in particular, should be devised according to the user-centred method (Wong, Chan, & Siu, 2010). Because there are so many boundary classifications and types of user/boundary interactions, evaluating existing boundaries and developing new ones is a complex issue. To investigate the design opportunities of subway boundaries, non-users should be made aware of the distance between the current design and user centred design. This study thus applied the boundary classifications to search for user-focused design opportunities. First, the boundaries were classified into several groups, each of which can be represented with a number. Invisible and visible boundaries are distinguished with positive and negative numbers, as shown in Figure 17. Figure 17. First step of the evaluation approach. 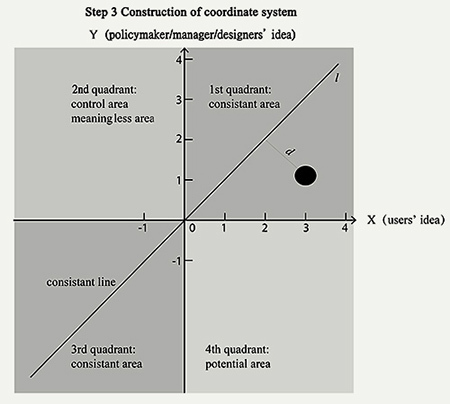 Second, the boundary is described using points with coordinate values x and y, which represent user-centred design and the current state. The group number of current designs can be described through observation. Users’ expectations for boundaries should be obtained through interview and observation. Interviews allow for users’ opinions to be obtained directly. Their answers to questions should always be the first hand source for design. Asking questions should lead to a deeper understanding of the inner thought processes and experiences of interviewees (Denscombe, 2010). Researchers can ask users what group the boundary should be in or their feelings about current boundaries. Users’ feelings that they are being controlled, that the design is meaningless, or that they expect to be protected are frequent responses to design, and often correspond to different design improvements. However, users often do not pay much attention to design issues or cannot clearly express their ideas. In such situations, observations should be used. The rate of users’ utilisation of a boundary and their unexpected usage modes demonstrate whether its current design is appropriate. Through the observation, when users’ unexpected usage model emerged, design opportunities would also emerge, as shown in Figure 18. Figure 18. Second step of the evaluation approach. Third, a coordinate system was constructed. The coordinate values of these boundaries will be input to this system. In Figure 19, the X-axis represents the users’ idea while the Y-axis represents the policymaker/manager/designers’ idea, which can be considered a non-user-focused design (Kwok & Siu, 2004). Line l is an assembly of the points with the same value of x and y, which defines when the existing design matches a user-centred design. The four quadrants of the graph demonstrate different design opportunities. The first and the third quadrants are consistent areas, where the distance (d) between the boundaries’ points and the line show each boundary’s degree of user-centredness in its design. 2nd Quadrant described boundaries that are controlling and meaningless. Boundaries that fall into this quadrant should be removed or re-designed. 4th Quadrant is a potential area, which means that those barriers that fall within the quadrant have the potential to benefit from many design opportunities. Figure 19. Third step of the evaluation approach. Finally, we have used some specific examples to illustrate this method. Figure 20 provides a visual representation of the results of a process of doing it. Figure 20. Example of applying the evaluation method. 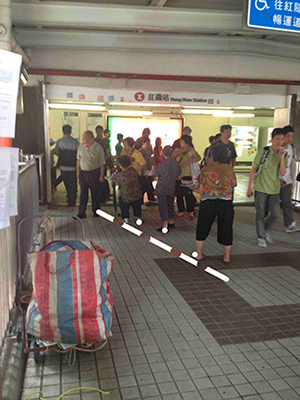 In Sheung Shui station, bootleggers disrupted the motion of users. The MTR has recently begun to crack down on bootleggers by forbidding passengers from entering the station with more than 32kg of luggage. Our interviews indicated that, although this policy reduced the number of bootleggers, it also adversely affected the everyday travel of law abiding passengers. For some of the station’s users, this boundary was a meaningless and controlling design. It is shown as point A in Figure 20. Figure 21 shows the electronic balance at the entrance of Sheung Shui station. Figure 21. Meaningless visible boundaries in a MTR station. If the boundary is designed to be visible but users require an invisible boundary, then users feel that a type of unnecessary control is being exerted. Many of the platforms on the MTR’s Hong Kong Island Line are designed as shown in Figure 22a. The space between the railway edges and the wall is narrow and low. This space can become quite crowded when users are waiting for trains. We interviewed several passengers about their impressions of the platforms during rush hour on the platform. Interviewee 1: Of course I feel crowded, especially during the rush hour. So many people there and so limited space! I have to move through the crowd to find waiting lines, if any are available. Interviewee 2: I feel it is difficult to form a line. People stand randomly in the limit space. I don’t know where the end of a queue is. The safe guard is so necessary in this platform to protect the passengers. People considered the platforms crowded and oppressive (as shown in Figure 22b). The length of the waiting area for passengers on the platform is only 200 mm, and during rush hour passengers can stand in five or more irregular lines. The limited space increases users’ feelings of being controlled. In Figure 20, this boundary is positioned at point B. It is a controlling design. Figure 22. Platform in Causeway Bay: (a) no passenger, (b) full of passengers. Designers can find potential opportunities for design in barriers that fall into the fourth quadrant, which are characterised by when users’ desires have gone unrealised. If designers were to identify and rectify these points, then they would increasingly emerge as first quadrant boundaries. From this perspective, the MTR station chairs pose an interesting classification problem. We have done a survey of the platforms of two stations: Tsim Sha Tsui and Sha Tin. The seats in these two stations are different in size and form. The rate of utilisation in these two places is similarly diverse. Interviewee 1 (in Tsim Sha Tsui station): If I am tired in the platform, I would take a seat. Otherwise I would not. I think the seat in this station (Tsim Sha Tsui) is too small for me to share with other people. I don’t want my body to touch with others. Interviewee 2 (in Sha Tin station): I think the boundary in the seat is necessary. I would choose to sit on the left or right side instead of the middle. I would feel controlled if I had to sit between two strangers. But if I am quite tired, it’s OK–at least there is a boundary there. Figure 23. Chairs without visible boundary in a MTR station. Figure 24. Chairs with visible boundaries in a MTR station. This can be explained by the aforementioned “body field.” People do not want to disturb the invisible fields of others, and the fields can be quite large if there isn’t a physical boundary present. The two cases correspond to points C and D in Figure 20. The closest subway station in Shenzhen (just across the border from Hong Kong in the Chinese mainland) is undergoing a design change bringing boundaries in the potential quadrant into 1st Quadrant. Some of its chairs have been designed with visible boundaries (Figure 25). As this station was constructed recently, it can continue to develop its facilities based on the experience of Hong Kong’s MTR. Figure 25. Chairs with visible boundaries in the Shenzhen subway station. Employing principles of user-centred design theory, the study categorised boundaries and placed these into a coordinate figure with different classifications. Each existing boundary is positioned within the quadrants based on users’ anticipations and non-users’ ideas. During the design process, non-users should try to design high quality and sustainably developed boundaries. Boundary improvement can be promoted based on user-centred design theory and the properties of each quadrant. Newly designed boundaries should be user-centred. When designs coordinate with reasonable anticipations, users should interact with them in an appropriate way instead of changing the boundaries with their own interpretations. Non-users should be sensitive to the invisible boundaries in public spaces and find design opportunities by observing users and administering user surveys. Controlled boundaries should be improved and meaningless boundaries should be removed. Whether a boundary is controlling depends on how a user interacts with it. This study was conducted in Hong Kong. Although Hong Kong MTR is a typical subway with people of diverse cultures and backgrounds, the phenomena observed in this city are quite specific to Hong Kong culture. As Schadewitz (2009) stated, in an increasingly multi-cultural environment, designers and design educators need to be aware of differences that may affect the usefulness of a learning design solution across cultures. Future studies should compare how culture affects peoples’ behaviours with barriers in order to obtain a more universal design instruction. Urban space boundaries change and develop in terms of form and function, and people don’t always interact with these changing boundaries in predictable ways. 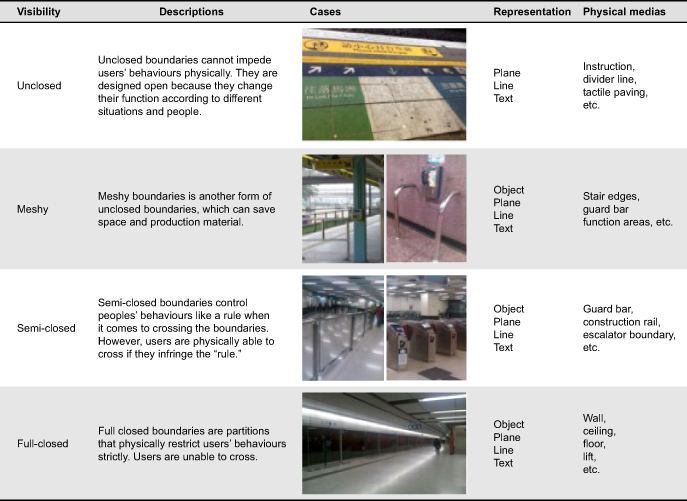 This paper uses Hong Kong’s MTR as a case study to examine the relationships between boundaries, space, and human behaviour; it offers instructions on how to improve boundary quality. Whether physical, psychological, or sociocultural, boundaries separate and distinguish. This paper analyses the dependent relationship between boundaries and space. It also points out how MTR boundaries are used to distinguish the characteristics, functions, and sizes of separate spaces in an effort to make the boundaries easier to identify. This study classifies boundaries into five groups: free style, unclosed, meshy, semi-closed, and full closed. These classifications describe both visible and invisible boundaries, as well as physical and psychological boundaries. The MTR case study was used to clarify these classifications. In order to analyse human interactions with boundaries, people were divided into groups: policymakers, designers, managers, and users. Each of these roles contributes to the development and construction of boundaries within a space. The dominant role of non-users and the passive role of users correspond with each other. Users interact with boundaries according to the rules made by non-users. However, users have the ability to de-territorialise and re-territorialise space at any time. This study provided a new method for perceiving boundaries in public spaces, and expected to bring insights to and stimulate more discussion on the topic. Further comprehensive case studies on different physical and social contexts are important to enrich the findings and generate further knowledge. The authors would like to thank The Hong Kong Polytechnic University for the research funds and research postgraduate grants for this project. The authors also thank Massachusetts Institute of Technology for the visiting scholar grants during the final preparation of the paper. The reviewers and Editor of International Journal of Design gave the authors a lot of valuable comments for the revision of the paper. All figures and photos of the paper were captured and drawn by the authors. Ashihara, Y. (1983). The aesthetic townscape. Cambridge, MA: MIT Press. Baroth, J., Schoefs, F., & Breysse, D. (2011). Construction reliability: Safety, variability and sustainability. London, UK: Wiley. Baxter, V., & Kroll-Smith, S. (2005). Normalizing the workplace nap: Blurring the boundaries between public and private space and time. Current Sociology, 53(1), 33-55. Berger, A. A. (1998). Media research techniques (2nd ed.). London, UK: Sage. Blomley, N. (2005). Flowers in the bathtub: Boundary crossings at the public–private divide. Geoforum, 36(3), 281-296. Blomley, N., Delaney, D., & Ford, R. T. (Eds.). (2001). The legal geographies reader: Law, power and space. London, UK: Blackwell Publishers. Boyer, C. (2000). Crossing cybercities: Boundary problems separating the regional space of the city form the matrix of cyberspace. In R. Simmonds & G. Hack (Eds. ), Global city regions: Their emerging forms (pp. 214-228). London, UK: Spon Press. Brenner, N. (1999). Globalisation as reterritorialisation: The re-scaling of urban governance in the European Union. Urban Studies, 36(3), 431-451. Coleman, R., Clarkson, J., Dong, H., & Cassim, J. (2007). Design for inclusivity: A practical guide to accessible, innovative and user-centred design. Hampshire, UK: Gower Publishing. Cresswell, T. (1996). In place/out of place: Geography, ideology, and transgression. Minneapolis, MN: University of Minnesota Press. Denscombe, M. (2010). The good research guide: For small-scale social research projects. London, UK: Open University Press. Dewulf, G., & van Meel, J. (2002). User participation and the role of information and communication technology. Journal of Corporate Real Estate, 4(3), 237-247. Ding, S. (2008). Users’ privacy preferences in open plan offices. Facilities, 26(9), 401-417. Dittmar, H. (1992). The social psychology of material possession: To have is to be. New York, NY: St. Martin’s Press. Garner, S., & Evans, C. (2012). Designing for people. In S. Garner & C. Evans (Eds. ), Design and designing: A critical introduction (pp. 127-128). London, UK: Berg. Green, W. S., & Jordan, P. W. (2002). Pleasure with products: Beyond usability. London, UK: Taylor & Francis. Hsia, C. J. (1994). 公共空間 [Public space]. Taipei, Taiwan: Artists Publisher. Huang, E. M., & Mynatt, E. D. (2003). Semi-public displays for small, co-located groups. In Proceedings of the SIGCHI Conference on Human Factors in Computing Systems (pp. 49-56). New York, NY: ACM. James-Chakraborty, K., & Strümper-Krobb, S. (2011). Crossing borders: Space beyond disciplines. New York, NY: Peter Lang Publishing. Junnila, S. (2007). The potential effect of end-users on energy conservation in office buildings. Facilities, 25(7), 329-339. Kaya, S. (2004). Relating building attributes to end user’s needs: “The owners-designers-end users” equation. Facilities, 22(9), 247-252. Keinonen, T. (2010). Protect and appreciate – Notes on the justification of user-centred design. International Journal of Design, 4(1), 17-27. Kimbell, L. (2011). Designing for service as one way of designing services. International Journal of Design, 5(2), 41-52. Kwok, Y. C. J., & Siu, K. W. M. (2004). The weight of space: Participatory design research for configuring habitable space for new arrival women in Hong Kong. Hong Kong: The Hong Kong Polytechnic University Public Design Lab Press. Lawrence, R. J. (1984). Transition spaces and dwelling design. Journal of Architectural Planning and Research, 1(4), 261-271. Lee, D. H. (2009). Mobile snapshots and private/public boundaries. Knowledge, Technology & Policy, 22(3), 161-171. Liu, L., Xu, J. S., & Lei, Y. H. (2011). 公共空間邊界設計[The border design of public space]. 華中建築, 1, 116-119. Lockton, D., Harrison, D. J., Cain, R., Stanton, N. A., & Jennings, P. (2013). Exploring problem-framing through behavioural heuristics. International Journal of Design, 7(1), 37-53. Lynch, K. (1960). The image of the city. Cambridge, MA: MIT Press. Marginn, P. J. (2007). Towards more effective community participation in urban regeneration: The potential of collaborative planning and applied ethnography. Qualitative Research, 7(1), 25-43. Marx, G. T. (2001). Murky conceptual waters: The public and the private. Ethics and Information Technology, 3(3), 157-169. Merriam, S. B. (1988). Case study research: A qualitative approach. San Francisco, CA: Jossey-Bass. Nippert-Eng, C. (2007). Privacy in the United States: Some implications for design. International Journal of Design, 1(2), 1-10. Ozaki, R., & Lewis, J. R. (2006). Boundaries and the meaning of social space: A study of Japanese house plans. Environment and Planning D: Society and Space, 24(1), 91-104. Pask, G. (1975). Conversation, cognition and learning. Amsterdam, The Netherlands: Elsevier. Patterson, P. (2012). User-centred design. In S. Garner & C. Evans (Eds. ), Design and designing: A critical introduction (pp. 129-143). London, UK: Berg. Pemsel, S., Widén, K., & Hansson, B. (2010). Managing the needs of end-users in the design and delivery of construction projects. Facilities, 28(1), 17-30. Sack, R. D. (1986). Human territoriality: Its theory and history. Cambridge, MA: Cambridge University Press. Sanoff, H. (1992). Integrating programming, evaluation and participation in design: A theory Z approach. Aldershot, UK: Ashgate. Schadewitz, N. (2009). Design patterns for cross-cultural collaboration. International Journal of Design, 3(3), 37-53. Siu, K. W. M. (2001). The practice of everyday space: The reception of planned open space in Hong Kong (Doctoral dissertation). The Hong Kong Polytechnic University, Hong Kong. Siu, K. W. M. (2003). Users’ creative responses and designers’ roles. Design Issues, 19(2), 64-73. Siu, K. W. M. (2005). 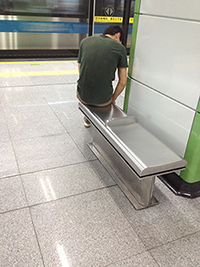 Pleasurable products: Public space furniture with user fitness. Journal of Engineering Design, 16(6), 545-555. Siu, K. W. M. (2007). Guerrilla wars in everyday public spaces: Reflections and inspirations for designers. International Journal of Design, 1(1), 37-56. Siu, K. W. M. (2008). Quality in design: User-oriented design of public toilets for visually impaired persons. In H. Pham (Ed. ), Recent advances in reliability and quality in design (Series in reliability) (pp. 441-463). New York, NY: Springer. Siu, K. W. M. (2009). Quality in design: Policy, implementation and management. In K. W. M. Siu (Ed. ), New era of product design: Theory and practice (pp. 3-15). Beijing, China: Beijing Institute of Technology Press. Valk, A. J. J., & Dijk, T. V. (2009). Regional planning for open space. London, UK: Routledge. Veryzer, R. W., & Borja de Mozota, B. (2005). The impact of user-oriented design on new product development: An examination of fundamental relationships. Journal of Product Innovation Management, 22(2), 128-143. Wei, R., & Leung, L. (1999). Blurring public and private behaviors in public space: Policy challenges in the use and improper use of the cell phone. Telematics and Informatics, 16(1), 11-26. Weintraub, J. (1997). The theory and politics of public/private distinction. In J. Weintraub & K. Kumar (Eds. ), Public and private in thought and practice (pp. 1-42). Chicago, IL: University of Chicago. Yigitcanlar, T. (Ed.). (2010). Rethinking sustainable development: Urban management, engineering, and design. New York, NY: Engineering Science Reference. Yin, R. K. (1994). Case study research: Design and methods (2nd ed.). London, UK: Sage. Appendix 1: Questionnaire Given to the Subway Users with Pictures of Boundaries. Please classify the boundaries in the MTR station and illustrate your reason.